To judge from their similar style and dimensions, these two canvases should be considered a pair, both depicting Old Testament scenes. They were formerly in the Watney collection in the UK and were later in a private Venetian collection. The two were acquired around 1977 by Hans Heinrich Thyssen-Bornemisza and were added to the collection at Villa Favorita. These canvases, which are unique within Tintoretto’s oeuvre, were published for the first time by Pierluigi de Vecchi nine years after they were acquired for the Collection. 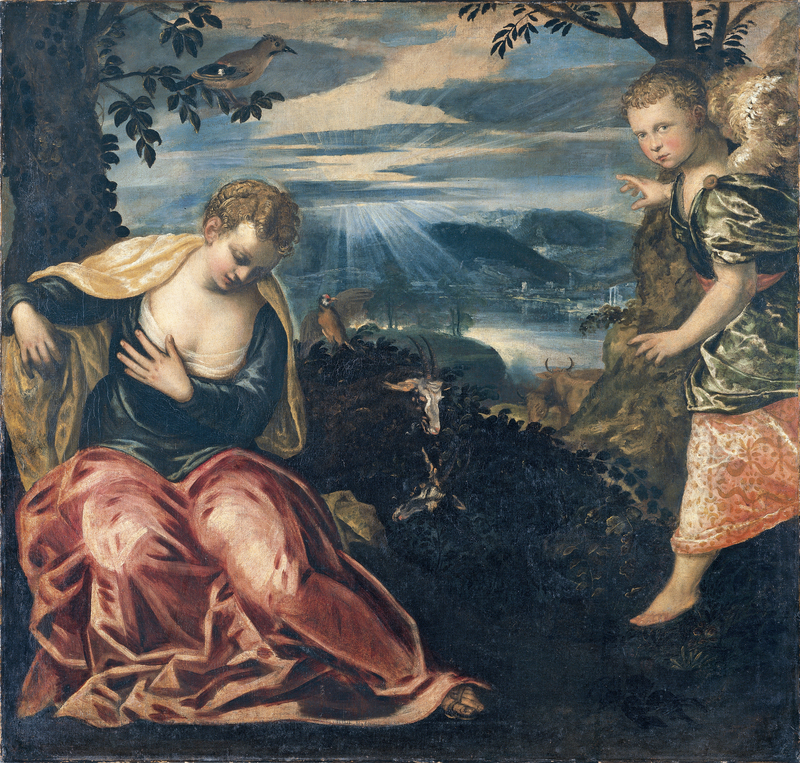 They were later included in Rodolfo Pallucchini’s monograph on Tintoretto, written in collaboration with Paola Rossi in which it was suggested that they date from around 1555–60. The story of Judah and Tamar is recounted in Genesis. Judah was married to the Canaanite Shuah, with whom he had three sons: Er, Onan and Shelah. Er married Tamar, but he was “wicked in the sight of the Lord” and God killed him. Judah thus proposed that his second son Onan marry Tamar, his brother’s widow, but Onan was not in agreement and God also killed him as his notorious conduct displeased him. In the light of these events Judah ordered Tamar to live in her father’s house until his third son Shelah came of age. The years passed, Judah became a widower and one day Tamar was told that he had gone to Timnath to shear sheep. Tamar cast off her widow’s weeds, put on a veil and sat down on the road to Timnath. When he passed by Judah mistook her for a prostitute as she had her face covered and suggested that she lie with him. Tamar asked for payment in kind, receiving a kid, his signet, bracelets and the staff in his hand. Judah sent the kid with his friend the Adullamite, but he could not find Tamar. Around three months after this event Judah was told that his daughter-in-law had prostituted herself and was pregnant. He replied that she should be brought forth and burned. When shown the possessions of the man who had left her pregnant, Judah recognised them and responded: “She hath been more righteous than I; because that I gave her not to Shelah my son”. With some degree of licence Tintoretto depicts this scabrous tale that took place on the road to Timnath. The second episode comes from the Book of Judges and narrates the birth of Samson. According to the text, an angel appeared to Manoah’s wife, who was sterile, to announce that she would give birth to a son “and no razor shall come on his head: for the child shall be a Nazarite unto God from the womb and he shall begin to deliver Israel out of the hand of the Philistines”. The angel appeared for the second time to Samson’s mother when she was alone in the countryside. To judge from the position of the figures, the moment painted by Tintoretto seems to be that of the angel’s first appearance. The artist used similar compositions for the two canvases. The female figures are located on the left while Judah and the angel are on the right, leaving spaces in the centre for the extensive landscapes. The colour range and elegance of the figures have been related to the phase of Tintoretto’s career in which he was particularly interested in responding to Veronese’s compositions and pictorial effects. The combination of pale pinks, yellows and ochres contrasting with the blues and greys in the landscape in the scene of Tamar and Judah result in an “idyllic sensibility” according to Pallucchini. These two canvases have been related to other works such as Summer (National Gallery of Art, Washington), in which the head of the allegorical figure has the same features as Tamar; and Saint George and the Dragon (National Gallery, London) which has a fortress in the background also to be seen in Tamar and Judah, as well as an approach to composition and colour comparable to that in both the present canvases. The present works deploy a refined, luminous colouring typical of Tintoretto’s output of the 1550s.